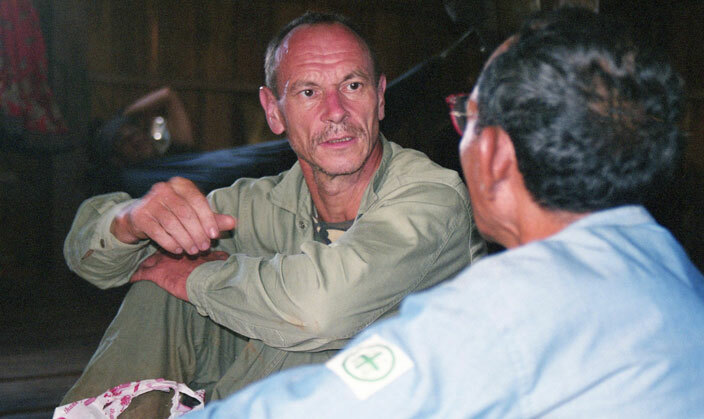 "For more than twenty years, on his own time and at his own expense, Sylvain Vogel has traveled to Cambodia’s most remote and malarial forests to document the language, culture, and folklore of Cambodia’s Bunong hilltribe," said FRF founder and chairman Dr. Peter Maguire in his announcement of the award, "Vogel is exactly the type of prolific, under supported, and independent scholar that our foundation looks to help." FRF will bring Vogel to Wilmington in 2017 where he and Maguire will translate his latest work into English and interview some of the Cambodian Bunong who have resettled here. Vogel and his Bunong teacher and collaborator, Nchööp. 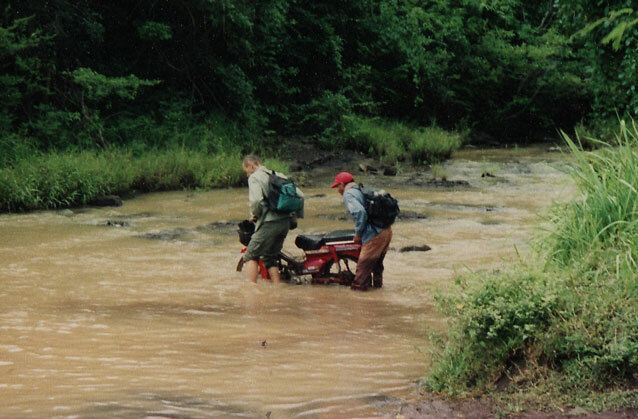 Vogel and Nchööp traveling to a Bunong village in Mondulkiri. 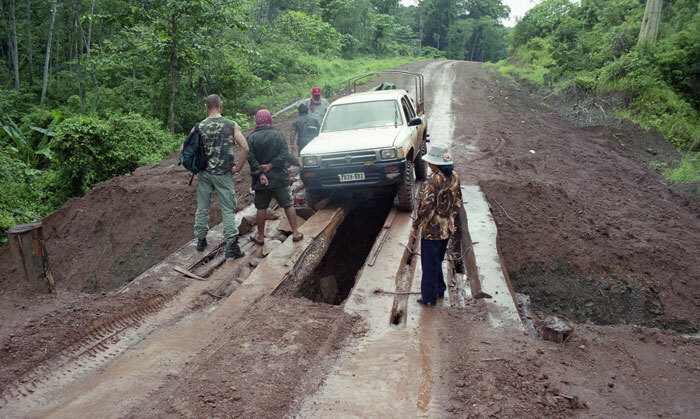 Crossing a bridge on the way to Mondulkiri. Vogel and Nchööp interviewing one of the last surviving elephant tamers. Bunong elephant tamer with his lasso. Southeast Asia’s hill tribes (Montagnards) have been dying a slow, agonizing death since their American allies withdrew from Southeast Asia in 1975. Prior to the Vietnam War, one million people inhabited the highlands of Vietnam, Cambodia and Laos where the thirty-three tribes spoke their own languages, worshipped their own Gods, and lived according to their own rules. Because the surviving 30,000 Bunong remain largely unilingual, their language is one of the last authentic examples of the old base of Mon-Khmer languages. 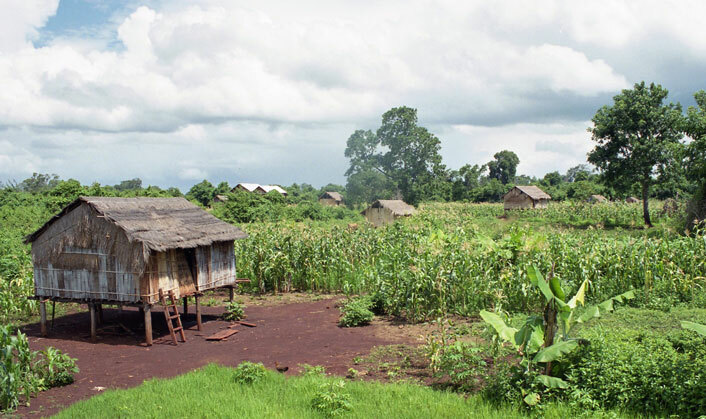 This research is both important and time sensitive because hill tribe languages and cultures are vanishing due to deforestation and the encroachment of the exogenous populations of Cambodia and Vietnam. Vogel’s discoveries about the phonetic and syntactic features of Bunong have invalidated many linguistic theories and helped to refine others. After studying their language and immersing himself in their culture, Sylvain Vogel learned of a vast body of unwritten literature that was passed down from generation to generation. These philosophical stories of causation explain everything from the mysterious construction of temples at Angkor Wat to the Vietnam War. Vogel believes that the structure of these aetiologic tales proves that the Bunong live self sufficiently in the forest by choice, they "rejected the coercion of the nation state or any other outside ruler." Not only is this hill tribe conscious of having both a literature and orature, their language has specific terms for each literary genre (epic tale, mythical story, etc.). For many Western researchers these genres are difficult to define. Vogel, however, has shown that the defining criterion is the sound of the recitation in this monosyllabic language: singing, repetition within a single stanza (theme/rhyme) or grammatical structure (subject/predicate), assonance, or a rupture marking a conclusion. The linguist identified examples of phonetic reduction, the neutralization of sequences, the use of deictic particles, and enunciation. Sylvain Vogel’s two books and three journal articles on the Bunong have clarified and resolved a number of linguistic debates. 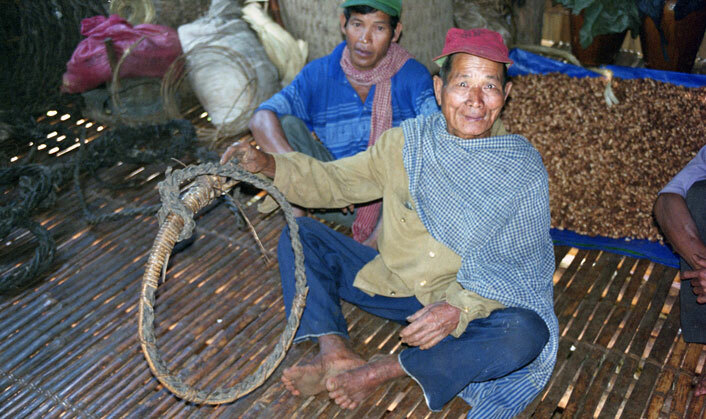 As the Cambodian forest vanishes so does the hill tribe’s means of sustaining their traditional way of life. The changing economics of globalism, the imposition of the sovereign state system, and ethics of the outside world have forced many to abandon their traditional, egalitarian values and the freedom they once enjoyed as independent farmers and hunters. "I was only a witness who watched, with great sadness and a feeling of helplessness, the disappearance of a culture,” said Vogel, “No wishful thinking, no culturally sensitive language, no crying, or bleeding of hearts, can change a thing." 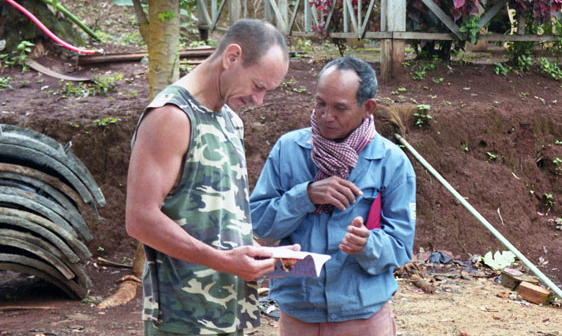 "What Sylvain Vogel accomplished is astonishing, his latest book, published by UNESCO, Voix du Mondolkiri historique, is a tribute to the oral literature of the Bunong, which the linguist compares to The Iliad. Given that Vogel is also a master of ancient Greek, Latin and Sanskrit, he knows what he is talking about"
"The story of Mr. Vogel is quite curious. A recognized specialist of Persian and Pashto, he was ranked 1st in the Centre national de la recherche scientifique (the largest governmental research organization in France) entrance examination in 1992….He learned Khmer, founded a department of linguistics where he taught Khmer, and studied Phnong, to which he had already devoted three books and two articles to the Asian Journal (2000 and 2007). The reasons why no French scientific institute has chosen to recruit this very brilliant and productive linguist would undoubtedly be the subject of an interesting article in academic sociology"
—Professor Gérard Fussman Collège de France. Sylvain Vogel received his undergraduate degree from Strasbourg University in 1976 and spent most of 1977-1991 in Afghanistan and Pakistan. 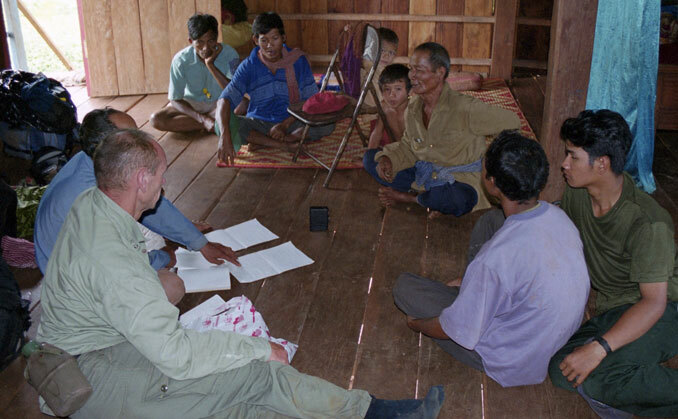 The fieldwork he conducted in Baluchistan on the Wanetsi dialect of Pashto became his dissertation, “Aspects of the Pashto Verb.” After receiving his doctorate from the Sorbonne, Vogel moved to Cambodia where he reestablished the linguistics department at Phnom Penh University and began to document the language, culture and folklore of the Cambodian hilltribes. Vogel is the author of: "Conflits ethniques au Balouchistan pakistanais : deux récits en wanetsi," Journal Asiatique, 1988; "Syntagme verbal et aspect en Pashto," Bulletin de la Société de Linguistique, 1991; "Oppositions aspectuelles et injonction en Pashto," Bulletin de la Société de Linguistique, 1994; "Impératif, sémantique modale et personne en Pashto," Studia Iranica, 1989; "Pronoms et particules énonciatives en phnong," Journal Asiatique, 2000; "Classificateurs et quantifieurs en khmer moderne," BEFEO, 2002; "Noms en em- ploi syncatégorématique en khmer et en francique," Bulletin de la Société de la linguistique de Paris, 2003; Introduction à la grammaire de la langue et aux dits traditionnels des Phnong de Mondulkiri, Editions Funan, 2006 (a 260-page book about the grammar and the traditional poetry of the Cambodian province of Mondulkiri; Chants phnong du Mondulkiri, Editions Funan, 2008.